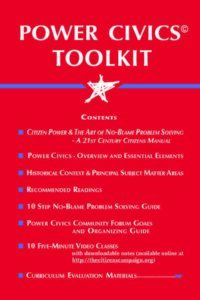 Thank you for your interest in the Power Civics Toolkit. Power Civics is a complete curriculum component designed and developed to teach college students and adults about becoming citizen leaders who are aware that they have new powers that go beyond voting and that they can play a new role as “public citizens” in our 21st century democracy. Yes, we all can acknowledge that our communities face serious problems, but we also have the power to offer serious solutions. We hope you find this Toolkit useful as you take your students on an exciting journey of civic empowerment!